The St. Charles Parish Library Planetarium is one of the only planetariums in the United States associated with a public library. 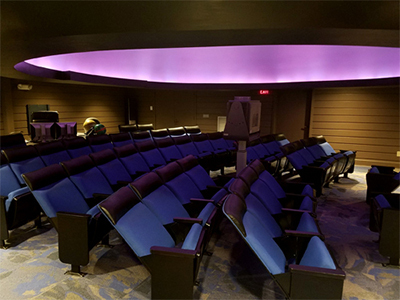 Our planetarium helps to increase the public's understanding of science and our universe through interactive presentations on a 360 degree, digital surround-sound, 20-foot dome theater. The planetarium is located just 20 miles west of New Orleans on US 90. The Planetarium can be booked for school field trips, girl and boy scout troops, senior citizens groups, and other community organizations. Visit our Group Showings page for more information. Travel Back to the Moon for Good to learn about the first privately funded lunar lander scheduled to touch down this month. Join Elmo and Big Bird as they explore the night sky in One World, One Sky: Big Bird’s Adventure. Explore our Earth, Moon, & Sun system along with a zany coyote that has a lot of wrong ideas about our planet.